Silver and Gold Jewelry is Jewelry made with the combination of Gold on Silver to create a multi-colored effect and a new look in American Jewelry. A Silver and Gold Ring is actually more sticking than a plain Gold Ring and other types of Jewelry items such as Silver Gold Pendants, Bracelets and even large Gold and Silver Necklace sets stand out as being unusual Jewelry from the crowd. Durango Silver Company has been making multi-colored Silver and Gold, mixed metals, Jewelry for quite some time now, however, it is just recently that our market has increased for this type of Jewelry. As of January 2011 Silver is about $30.00 per ounce and Gold is at $1400.00 per ounce which makes the idea of Sterling Silver and Gold Jewelry attractive, visually as well as financially. 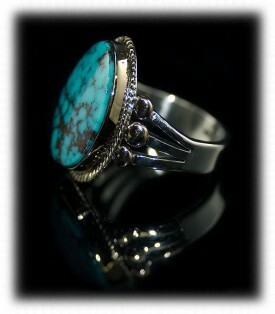 When we throw in a third color, especially Turquoise, the Gold and Silver Jewelry really stands out. 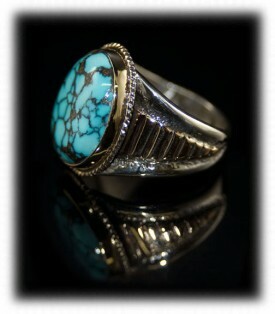 A Gold and Silver Mens Rings with a high quality Turquoise Stone is extremely attractive when worn by a gentleman. I, John Hartman (founder of Durango Silver Company) prefer a Silver Ring accented with Gold as I find it very masculine and handsome for myself. In fact, many people comment on my Gold and Silver Rings when I wear them, many say they like the combination of Silver and Gold, many also come to my Jewelry Store and have a piece of Gold and Silver Jewelry made for themselves. We do believe Sterling Silver and Gold Jewelry to become new fashion Jewelry in the near future. We have been producing multi-colored gemstone Jewelry for the past ten years, now we will mix multi-colored gemstones with multi-colored precious metals - Silver and Gold. You can expect many new Silver and Gold combination designs from our company to be rolling out for 2011. We will pay close attention to the combination of Colored Gemstones in Silver and Gold mixed metals and we will definitely be putting a lot of our high grade Turquoise in this type of Jewelry for this year as well as into the future. Southwestern designs in Silver and Gold are very attractive and a grand form of American Jewelry. These days, it is becoming rare to find anything made in the USA, however, handcrafted Jewelry coming out of the Southwest is All American and that is another reason to consider Southwestern Silver and Gold Jewelry. Durango Silver Company will be producing more and more Jewelry in the Gold and Silver combination, we will produce many styles of Silver and Gold Rings both Mens Rings as well as Women's Rings with the combination of Silver, Gold, Turquoise and many other Colored Gemstones. 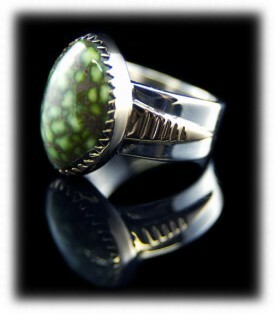 The photo above is of a Silver and Gold Ring with Damale or Damele Lime Turquoise from Nevada. As you can see the color combination is very unusual, attractive and even exciting. When worn, this Sterling Silver and Gold Ring stands out from the crowd and the eyes of many are attracted to this unusual color combination that you just do not see anywhere. 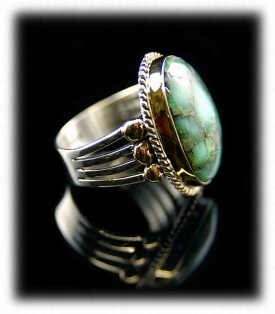 Learn more about Silver and Gold Turquoise Rings. 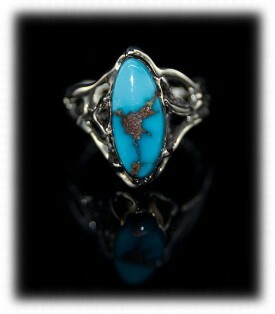 Here is another example of Silver and Gold Jewelry - A Sterling Silver and Gold Mens Ring with a quality Turquoise Gemstone. This is a high fashion piece of American Jewelry for a gentleman of which he will be very proud to wear. Not only is it a beautiful Mens Ring made in Turquoise, Gold and Silver - It is a piece of most interesting and attractive Jewelry that was handmade by Americans from the Great Southwest! 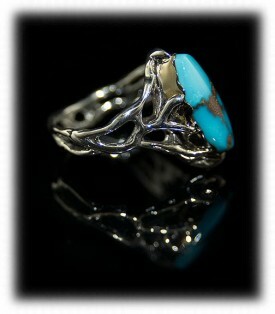 A Mens Silver and Gold Ring from Durango Silver Company is an piece of American Heritage and has True Grit! Another Gentleman's Turquoise Ring set in a Gold and Silver combination of mixed precious metals that includes an outstanding quality Turquoise Gemstone that is remarkably one-of-a-kind. This rare Spiderweb Turquoise Gemstone from the Blue Wind Turquoise Mine in Nevada is set in a combination of Silver and Gold, it will grab the eyes of anyone who is a fan of American handcrafted Jewelry. This type of Jewelry produced by Durango Silver Company is just not scene anywhere because these pieces of quality Jewelry are made one by one and are totally one-of-a-kind - Guaranteed! John Hartman of Durango Silver Company makes most of the mixed metal Gold and Silver pieces and he is very particular what he makes. His Jewelry is in museums, publications and has been purchased by important and noted individuals and fine establishments around the world. This Women's Sterling Silver and Gold Ring is also a one-of-a-kind made by Nattarika Hartman of Durango Silver Company. Nattarika has a different flair on her Jewelry as she is from Chiang Mai, Thailand and completed College in Thailand with a degree in the Arts. Her major was Textiles which gives her a different edge and outlook on the Art or making Jewelry. Nattarika is Dillon Hartman's wife and a great addition to the Hartman family of Artisans. Nattarika Hartman's Lost Wax style of Silverwork as in the above Womens Gold and Silver Rings is uncommon and totally in vogue of World Class Jewelry. 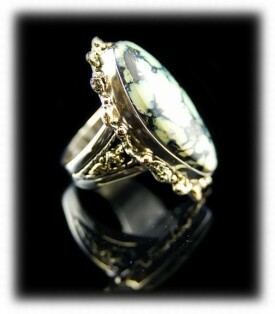 This Gold and Silver Ring was created by applying layer over layer of Jewelers Wax with a special Jewelry Wax Pen. It was then processed and casted in the Lost Wax method that dates back to ancient times. Follow her work and creations as she is a very talented Artisan and is going places! Check out her families Elephant Encampment business in Thailand at Chiangmai Elephant Tours. 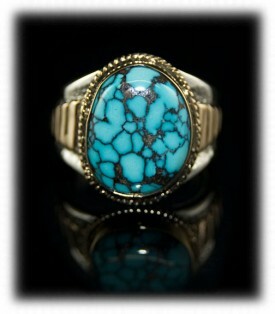 Another great example of a Silver and Gold Turquoise Ring by John Hartman of Durango Silver Company. 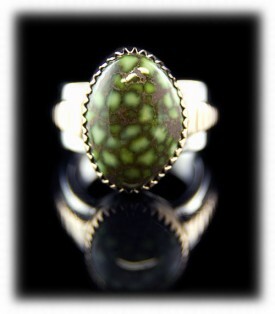 This Gold and Sterling Silver Ring was created around a beautiful Green Turquoise Gemstone from the Damele Turquoise Mine in Nevada. 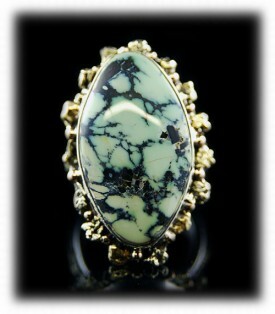 This Ring will really grab your attention in person as it will catch ones eye from the opposite side of a large room. The Emerald colored Turquoise Stone almost lights up and with the accents of Gold in Sterling Silver, it is a conversational piece of art that gleams the fact that it was handmade in the Southwestern USA and is American Handmade! Is this wild or what? This is a real conversational piece of Western Jewelry that will keep people talking for a while. This Gold and Silver Ring was made with a Tortoise Turquoise Gemstone that we mined from our Tortoise Turquoise Mine in Nevada. 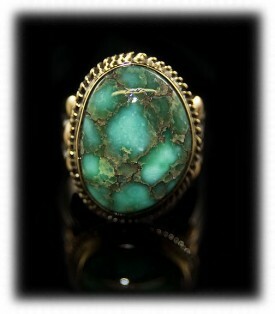 Gold Nuggets were set around the Turquoise Stone and then overlaid down both sides of the ring shank. This Gold and Silver Ring was made by John Hartman as a show piece and we sure have got a lot of attention from it. The Gold Nuggets are from the Colorado Rocky Mountains. Here is a piece that will catch your eye! 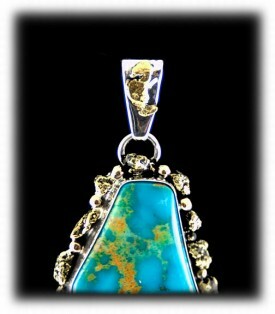 This Gold and Silver Turquoise Pendant was created by John Hartman of Durango Silver Company. 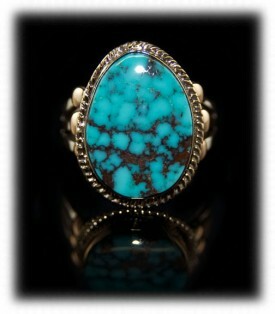 John cut to beautiful Turquoise Mountain Gemstone which is from the Kingman Turquoise Mine in Kingman, Arizona. This Turquoise stone is spectacular as it is a beautiful and vibrant blue with mossy green webbing running through the stone along with golden brown matrix. 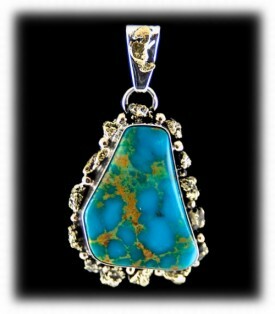 The stone was exciting to John so he created an astonishing pendant to show off this wonderful piece of Turquoise. It is set in Sterling Silver accented with Colorado Gold Nuggets which are about 22kt Gold. Pieces like this are fun and exciting to wear as they are appreciated by everyone who has the opportunity to see them. American Jewelry handcrafted by John Hartman is unusual and his pieces are all one-of-a-kind, made in Durango, Colorado USA. We hope you have enjoyed our presentation on Silver and Gold Jewelry and we hope you have gained some useful knowledge from this educational page. We invite you to learn more about Turquoise and Turquoise Jewelry by following the links in our Learning Center to other informational pages that we have written on different topics related to Turquoise Jewelry. In addition, we would like to invite you to join our E-Mail Newsletter - about once every other month we send out a Newsletter to inform our members of what's happening with Durango Silver Company, new products, specials for our members and more. We also have a monthly drawing from our member base to give away free Turquoise Jewelry from our company. Please take a moment to become one of our friends in our Silver Jewelry Club by signing in below. Thank you for reading about our Silver and Gold Jewelry.